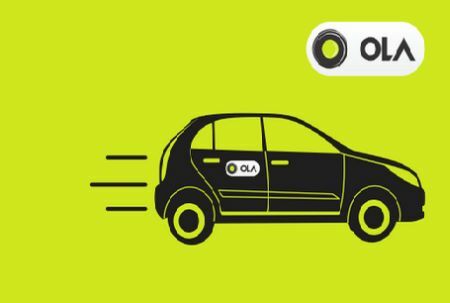 The Internet is going all gaga over Ola cabs. No, not for any discounted rides, but for their impressive response to a rather partisan request from a Hyderabad-based customer. Seelam Veerapa Naidu tweeted @Olacabs saying, "Being a Hindu i usually prefer Driver of Hindu Faith Only, Particularly in Hyderabad.. pls Give us a chance to Choose a Driver." And here’s how Ola responded: “Sorry, we do not discriminate against our drivers on the basis of their religion." Since then, the post has gone viral and been retweeted over 900 times. Applauding Ola for its firm reply was its rival Uber. @Olacabs. Well said guys, it said in a tweet. 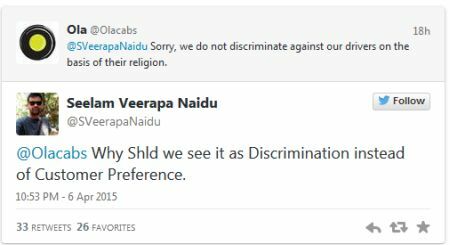 Naidu, who calls himself: a "Physician, SapioSexual, Neophyte, Political Scientist, economist, dreamer of alternate capital" on Twitter, defended his tweet, "@Olacabs Why Shld we see it as Discrimination instead of Customer Preference." Naturally, he has been slammed on Twitter. @justhowifeel_97: @Olacabs @SVeerapaNaidu why should they see you as a customer instead of a giant conservative pig." The exchange between Naidu and the radio cab service took place on Monday, but hit headlines on Tuesday making it one of the top trends on Twitter. Jammu and Kashmir Chief Minister Omar Abdullah cheered Ola tweeting, @abdullah_omar: Well done @Olacabs. More power to you. Former Union minister Milind Deora tweeted: Well done @bhash & @Olacabs. Keep it up! @gauravkapur: Ok internet. This specimen is all yours now. Also, well done @olacabs with the response. Respect. And there was some mocking as well on Twitter. @shubHASHISH tweets: @Olacabs I want Michael Schumacher as my driver. Please fix him quickly. Seeing the traction on Twitter, as an afterthought, Naidu tweeted, "@Olacabs My intention is not to hurt any one."